1) our reservations at the d'Orsay and Louvre in Paris and the Palais des Papes in Avignon are confirmed. Check our itinerary here and print out a copy to bring to France with you. 2) We will be taking the wonderful TGV (fast train) to Avignon from the Gare de Lyon train station in Paris and returning on the TGV either to the airport directly or to Paris (for those staying extra days in France). However, getting luggage onto the trains can be a challenge. We will need to stand at the exact place on the platform where our train car assignment is. And how will we know where that spot is? These signs generally appear on the platforms. We will know in advance what car we're on because I will have the tickets in hand. For example let's say we have reserved seats in 'voiture (car) 16'.. Look at the sign below and see the number 16. That's our car (or voiture). The letter C under it is also written on the platform so we just have to look for the letter C and stand by it.. Now you're in the know! Then we have to get our luggage onto the train - always an exciting event. And there probably will be no porters there to help you which is why I say over and over again: TRAVEL LIGHT!!! 3) I still recommend bringing some euros with you so you have enough to pay the cab. Even though by law they're supposed to accept credit cards some may not. I like to bring 250-300 just to get a head start and not have to spend any time in Paris going to an ATM. 4) If you arrive early to our hotel and the room is not quite ready leave your luggage and explore this wonderful neighborhood. 1) We will be meeting noon next Wednesday at the League on the 4th floor studio 6. Bring your questions. 2) Upon arriving at Charles de Gaulle Airport (CDG) you can take a cab to the hotel or have the hotel arrange a shared pick-up. The cab fare from CDG is now a flat rate of 50 euros, not counting tip. The shared pick up is cheaper but also a bit more complicated. When you arrive at CDG, go through passport control and get your bags before entering the terminal you will need to pick up a free courtesy phone to call a number you'll be given. You'll receive information about where to meet the shared van on that phone call. The van will undoubtedly be making other stops on the way. If you take a cab it wouldn't be a bad idea to have the name and address of the hotel written on a piece of paper to show the driver. Hotel France-Albion 11, rue Notre Dame de Lorette 75009. 4) We will have a meet and greet and orientation 5:00 PM in our hotel reception area. Then dinner next door. The dinner is included but not the wine or beer. Be prepared for a lesson in French wines from yours truly. 5) We will be taking the fast train (TGV) from the Gare de Lyon in Paris to Avignon. From our hotel in Paris we will be splitting the cost on cabs to get to the Gare de Lyon. We could take the Metro but that would prove a great hassle being that we'll have all of our luggage with us. When we arrive in the Avignon TGV station we will be splitting the cost on cabs and splitting the costs to our hotel - about a 10 minute ride. 6) The two options for our return to Paris are these: the direct TGV from Avignon to CDG leaving Avignon 9:51 AM and arriving in CDG 1:02. If your plane is leaving later than 3:30 or so you can take this train. If your plane is leaving earlier you will need to take the 7:14 AM TGV from Avignon arriving in Lyon 8:25, and take the 9:00 train to CDG arriving at 11:03. I'll be on that one with you. Once I know what you intend to do I will purchase the appropriate tickets for you. 2) If you're going to be using your cell phone to make calls in France please send me your phone number. I use AT&T and sign up for their Passport package so I can use my phone overseas. 3) Plan to take your meds on board.. Do not put them in your valise because if your stuff is delayed you certainly want to have your meds with you. 5) If you're coming early or staying late those extra days are your responsibility and you can pay the hotels directly. Here are some things to think about in preparation for our trip to Paris and then Avignon. But before you start reading take a look at your passport and make sure the expiration date is not coming up. 1) For those of you have not yet purchased your tickets remember that the dates of the workshop are October 3 - 11. This means you would fly out of the states on the 2nd to arrive in Paris by the 3rd. On the return you would fly out of Paris on the 11th. Prices are going up as we speak so get your tickets today! Once I know everyone's itineraries I can let you know who might be on your flight or who might be landing at or around the same time as you. 2) We will be taking the train from Paris to Avignon on the 6th and I will have our tickets in hand. I'm thinking we should take the 10:37 direct train from the Gare de Lyon in Paris to the Avignon TGV station arriving at 1:17 PM and then taxis to our hotel. We will be taking the train back on the 11th. This is what you need to know about the return train: There is one direct train from Avignon to Charles de Gaulle Airport leaving 9:51 AM arriving at CDG 2 at 1:02 PM. So if your return flight is 3:30 or later this is the train you can take. If your plane leaves for the states before 3:30 we can take the 7:14 AM train to CDG with a stop in the city of Lyon. There is a 35 minute wait for the train to CDG arriving at the airport at 11:03 AM. I will be taking that train with you to make sure we make the connection. 3) If you're not sure what flights to take give me a call and we can discuss it. Later I can let you know about how to get to the hotel from the airport. 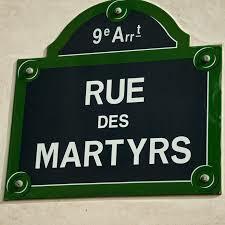 4) Our hotel, the Hôtel France-Albion is located just adjacent to one of the most charming and interesting streets in Paris - the Rue des Martyrs. There are numerous restaurants and specialty shops and even a really well stocked supermarket right there. Of course they have internet access and they will give you their password when you arrive. I will take a list later of who wants the hotel shuttle to pick them up. They will charge you but you can split that cost if you arrive together. 27 euros for one or 21.50 euros for two. 5) If you are planning to bring a phone or tablet or computer not to worry. No need to bring a converter because all of our devices are dual voltage so they will operate nicely on the French 220V system. 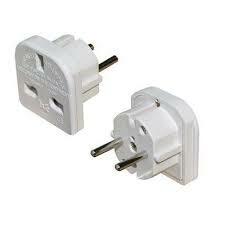 An adapter to their weird receptacles is all you need. There are several kinds and some look like this and are found on Amazon or Radio Shack or other places. 6) I would recommend getting this street map of Paris to familiarize yourself with the city and to see if you can locate where we'll be. https://www.amazon.com/gp/product/0935039252/ref=oh_aui_detailpage_o03_s00?ie=UTF8&psc=1 I have not been able to find a similar map of Avignon but if you Google it you could find one you can download to your tablet or phone. 7) A word to the wise is sufficient: seriously consider trip insurance. I always go to www.insuremytrip.com and let them do some comparisons for me. 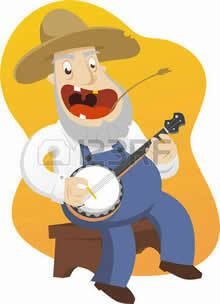 I need to find a company that insures musical instruments being that I carry a banjo with me. I don't suppose you'll be doing anything like that but there are some coverages you ought to consider. You can even call them and ask them specific questions. 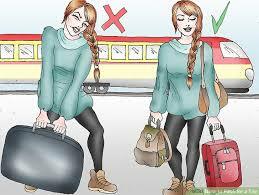 8) Another word to the wise: It is usually not possible to find a porter to help get your luggage aboard a train. For that reason you should look like the person on the right, not on the left. I'm serious - go light! Dress is always casual in France for us so eliminate what you absolutely don't need! ​10) You might want to call your cell phone service provider if you'd like to use your phone in Paris. Mine is AT&T and they have something called Passport which I always sign up for. Most of the providers have something. Of course you can use WhatsApp or Skype or other new fangled thing. 11) If you’re arriving early to the hotel your room might not be ready. You can leave your stuff in the reception area or the meeting room just adjacent and wander the neighborhood. The hotel is hotel France-Albion 11 rue Notre Dame de Lorette. Telephone: 001 33 1 45 26 00 81 (dialed this way when called from the US). 12) Paper towels in France are rather pathetic so if you use them in making your art bring a roll. 13) Bring your meds on board. Do not check them in with your luggage. 14) If you intend to use a credit or debit card notify your bank of your travel plans. Your card should probably be one with a chip on it. 15) I always like to bring some euros with me so I don't have to be running to an ATM machine right off the bat. Yes, there are ATM's near our hotel but you might need some cash before you arrive: if you take a cab or take the shuttle or RER. You can ask your bank if they can get you some.